Wisdom teeth removal is an area of dentistry that tends to have a lot of cases at one extreme or another - wisdom teeth removal is frequently either quite easy and straightforward, or else rather difficult, complex and risky. Every patient of mine panics a little when I tell them that they need a wisdom tooth extraction. But most of the time, there's no need to panic at all - a lot of the time, wisdom teeth removal can be quite straightforward!! So what are the things that make wisdom teeth removal either easy or difficult? There are several factors to take into account! Is it an upper tooth or a lower tooth? Is it still buried under the gum, OR has the tooth come through the gum? If the tooth is through the gum, how much is visible? Is the tooth positioned or angled like the next tooth, or is it tilted? If the wisdom tooth is tilted, is it jammed up against the tooth next door? Can the dentist get to the tooth easily? i.e.. how wide open can the patient open his/her mouth? And is the tongue and/or cheek lying over the wisdom tooth? 1. Upper tooth or lower tooth? First, how dense the surrounding bone is. And Second, what space there is behind the wisdom tooth. The upper wisdom tooth is surrounded by thin egg-shell thin bone. This means that it is not held in place very securely. The bone around it is thin and also NOT DENSE. These two things make the tooth relatively easy to remove. AND - added to that, the upper wisdom tooth does not have any bony structures or obstructions behind it. So there is nothing to prevent the tooth from moving backwards, away from the tooth next to it. Therefore, the upper wisdom tooth is NORMALLY quite easy to remove, by rotating it slowly backwards and downwards out of it's socket. 2. Is it under the gum? Or has it come through the gum? If the wisdom tooth is completely buried under the gum, then it is a little more challenging to remove. We have to make an incision through the gum, and peel it back so the tooth can be seen. - BUT THERE IS A PLUS POINT! - after the removal of the wisdom tooth, the gum will go back together with a couple of stitches (sutures), and heal up real quick! On the other hand, if the tooth is already through the gum, then it is easier to see and less likely to have a lot of bone around the neck of the tooth, holding it in. So it is not usually as difficult to remove as one that is under the gum. 3. If the tooth is through the gum, how much is visible? If it just the tip of a cusp or two, then the tooth is mostly still under the gum, and not easily visible. At the other end of the scale, a wisdom tooth may have grown up through the gum and actually be standing up above the level of the neighbouring teeth. This means that there is LESS ROOT still in the jaw bone, so the tooth is not held in the bone very securely, and therefore more easily removed. 4. Is the tooth sitting upright like the neighbouring tooth, or is it angled or tilted?Obviously, the wisdom tooth will be easier to remove if it is upright rather than if it is tilted. 5. Is the tooth jammed against the next door tooth? If it is, then things get difficult. 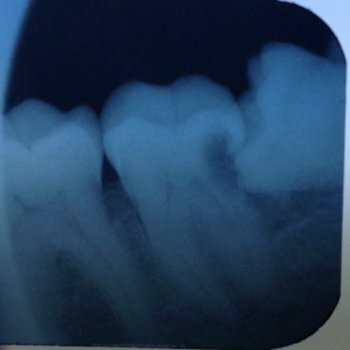 In the picture above, you can make out the wisdom tooth on the right side, tilted over and jammed up against the next door tooth. And it has caused a cavity in the side of the neighboring tooth. Both teeth will have to be removed. When a wisdom tooth is jammed against the next one, it is automatically tilted and also in tight contact with that next tooth. So there is no room for the tooth to move. How on earth do we get that tooth out? Well, there are several tricks of the trade that we can use! Imagine a tooth that is angled at 45 degrees against the next tooth. It is held in place by that tooth next door, and on the other side by a dense bone collar. So we have to make room for the tooth to move. Usually, the oral surgeon will first remove the top one third of the tooth, thereby removing the contact with the next door tooth. Then he will drill away the collar of bone around the tooth, particularly from behind the tooth, to allow the tooth to wiggle and then move backwards and rotate up and out. First of all, it can sit just above the nerve channel. But when the oral surgeon manipulates the tooth, it may press on the nerve before it comes out, causing nerve compression. The nerve will usually recover in one to twenty weeks, but you will have a tingling sensation in your lower lip and/or tongue on that side of your mouth during that time. Secondly, the root of the wisdom tooth may have grown around the nerve channel; This makes it very difficult to remove without affecting the nerve. There is a high risk of nerve damage. 7. Can the dentist or oral surgeon get to the tooth easily? Is it covered by the patient's tongue? Does the cheek tissue fall over the tooth? Does the patient have a small mouth, or cannot open their mouth very wide? All these things make the job of removing a wisdom tooth even more difficult, as if it wasn't difficult enough already! What about complications AFTER the extraction? Read up on Wisdom Teeth Removal Swelling. AND also Wisdom Teeth Dry Socket. and perhaps previous medical treatment that makes healing difficult, such as radiotherapy to the jaws for cancer, or a history of bisphosphonate treatment for osteoporosis. So, wisdom teeth removal can be really quick and easy - if it's in the upper jaw, grown through the gum straight, and easy to see for the dentist. OR it can be complicated and risky if it's a lower wisdom tooth that is tilted and jammed against the next tooth (impacted), and the patient cannot open very wide. Such a spread of difficulty! The healing of the gum where you get a wisdom tooth removed can be speeded up by applying a high-quality aloe vera gel directly into the gum socket, if you can get to it, or else just over the gum where the tooth used to be. The best aloe vera gel comes from an American company called Forever Living. You can read more about this HERE. But the more difficult cases are usually treated under general anaesthetic, so you don't know what's going on, and it's over when you wake up! Whatever, don't believe all your friends and family when they tell you to leave a wisdom tooth alone; it could be VERY easy to pop out!